I have mentioned before that my shop is very small, what realtors would describe as “cozy.” I have enough room to comfortably work on three dulcimers at a time during the primary steps of construction. As the dulcimers come closer to completion I work on each one individually until it is time for the finishing process to begin. The size of the shop doesn’t really allow much else to take place while I am doing finishing work. I’ve tried and the results were not pretty. The finishing process takes several days. A lot of the time is taken up by waiting for coats of finish to dry and cure. Drying happens quickly. Curing is the process of the finish hardening and becoming more stable and solid. Here are two dulcimers taking a break while the finish dries and cures. This gives them time to chat and catch up with each other. 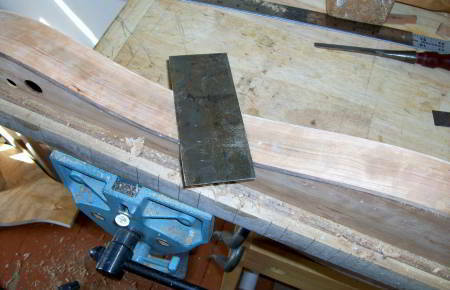 Preparing the dulcimers for finishing is the longest part of the process. 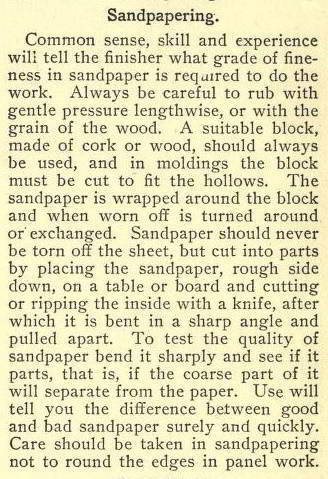 This begins in the traditional manner by using scrapers to smooth and clean up most surfaces. I use sandpaper to clean up most of the tool marks left by planes, scrapers and files. Sanding is a process of making increasingly finer scratches until they can no longer be easily seen. Sanding is also very messy. 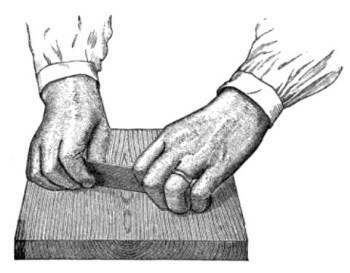 A few hundred years ago luthiers did not have sandpaper and they used planes, files and scrapers as their primary tools for preparing surfaces for finishing. The results are beautiful but do not produce the slick and polished look that people have come to expect from modern manufactured items. Handmade objects looked as if they were made by hand and showed signs of the craftsmanship involved in making them. This does not imply that handmade objects looked shoddy; it was a different aesthetic. 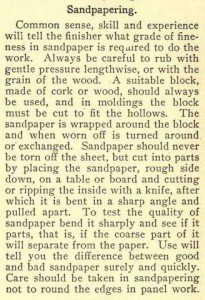 I prefer the look of planed and scraped surfaces that show the use of tools used by skilled hands. I am debating whether I will exclusively use these techniques some time in the future. I use a variety of finishes depending on the wood used and the visual and tonal qualities desired. I usually use shellac and a variety of oil varnishes and varnish oils, often in combination. I lean towards more or less non-toxic, traditional finishing materials. This choice is again primarily aesthetic; they provide the look and sound I prefer. I have used modern solvent-based finishes. They work well but can cause interesting short and long-term side-effects. Once while working with lacquer and lacquer thinner this crowd of happy folks kept showing up. 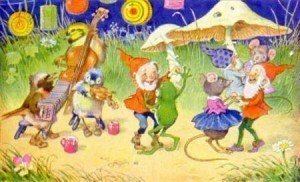 I enjoyed their jovial song and dance but after a while I realized that I was “not in Kansas anymore”, and if I continued using such products getting back here might become increasingly difficult in the future.. I always enjoy reading your blogs. It’s not only an enjoyable read, but a rare, up-close look and dulcimer building. Plus, there’s always some humor to look forward to (happy wee folk, eh?)! Take care, and I hope to see you in Coshocton, OH during Dulcimer Days in June. Always nice to hear from you. Thanks for the kind words. I look forward to seeing you in Coschocton. Thanks for referring to my misspent youth! another reader was talking about working out of a one bedroom apartment, not me. But thanks for reminding me of that old place on N. High Street. I really liked it. It was more of a shop than an apartment but that worked for me in my early 20’s. And you sure were brave being my “licensed driver” when I had my learners permit! Thanks for posting the info on Steve Parks. Dulcimer folks read my site so it may help get the word out to a few people. Y’know, I realized that I never explained why I chose to put this into your blog instead of emailing you directly. I did it because I figured that your circle of musician friends no doubt overlapped Steve’s circle of friends, and they might not have heard the sad news about his passing. He was a remarkable guy — a gifted musician, a luthier of rare artistry, and all in all, a neat guy — someone your loyal followers may like to know about. Is the one-BR apt. you referred to on Apr. 12 the one you had here, back in the 80s? If so, that was the looonnngest one-BR place I’ve ever seen! Wasn’t it more along the lines of a loft? I just remember a lot of dropcloths, wood that obviously had been sorted by *some* system, but not one I could discern at a glance, and a weird little patched-in bathroom. Oh, well — when one is in one’s mid-20s, one does little but sleep in one’s residence of record. Or, at least, that’s how it went with all of my student & musician friends! I just gave myself a migraine writing an entry for the online guest book. Can’t stand the flicker of computer screens! This is why I generally write on good old-fashioned legal pads. Hey, would you be absolutely mortified if I submitted a “How I Met Doug Berch” blog comment? Heck, you can edit it out, anyway. It’s more goofy than anything else, really, isn’t it? Oooh, and I can tell about being your “licensed driver” when you were learning to drive that old BTS yellow VW squareback. Wow. I can tell all sorts of fun war stories to your blog followers! P.S. Michael says “hi.” So does The Artful Dodger. Thanks for the encouragement to get away from sanding. I am leaning towards it, though I would probably continue doing a little sanding in a few places on the instrument. I also discovered the difference between a finish drying and curing the hard way! I haven’t noticed pure mineral spirits bothering me but some of the polyurethane based stuff I’ve tried immediately makes me feel a little funny all over, almost like I feel it on my skin as soon as the fumes get into the room. Lacquer thinner makes me feel strange rather quickly. I’ve considered trying some of the “green” water based finishes. Some other instrument makers I know have tried them. Some love it, some don’t like it at all. I’ll have to give it a go and see for myself. I was happy to read this. My work studio at present is one small corner of our bedroom, we have a one bedroom apt. Very cramped…or as you nicely said, cozy. Nice seeing you the other day. 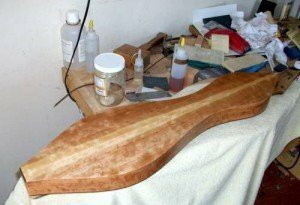 Years ago I built dulcimers while living in a one bedroom apartment. It is amazing what one can do with what one has when the urge is strong! Your situation and mine are very similar, although the objects I make and finish usually are considerably larger. A cozy shop at basement level, and noise, dust, and fumes rising. Over time I’ve looked at every type of finish I can apply by hand. After two and a half decades I have developed an acute reaction to mineral spirits: the smell instantly triggers a bad feeling in my stomach. So, it has come down to Tried and True pure linseed oil, shellac, or one of the newer “green” water based finishes. It took me years to understand the difference between a finish drying and a finish curing. That would have been valuable information way back when and would have prevented countless gnashed teeth! 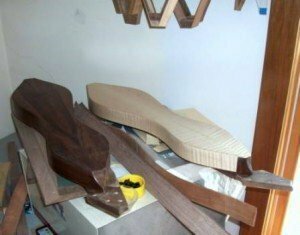 Now, violin makers don’t sand because they don’t want the grit particles embedded in the wood fibers. Couldn’t you use that as a selling point for leaving your finishes hand planed and scraped?